Four artists come together to publicly deal with their agencies as performance artists working within and beyond institutions and artworlds. The evening begins with a public discussion sparked by examples of artists leveraging their own careers in critical ways, like Adrian Piper's pulling out of the exhibition of black performance art Radical Presence, and by the participating artists' own experiences as professional artists, educators, scholars, and curators navigating ethical, political, social, and practical decisions. 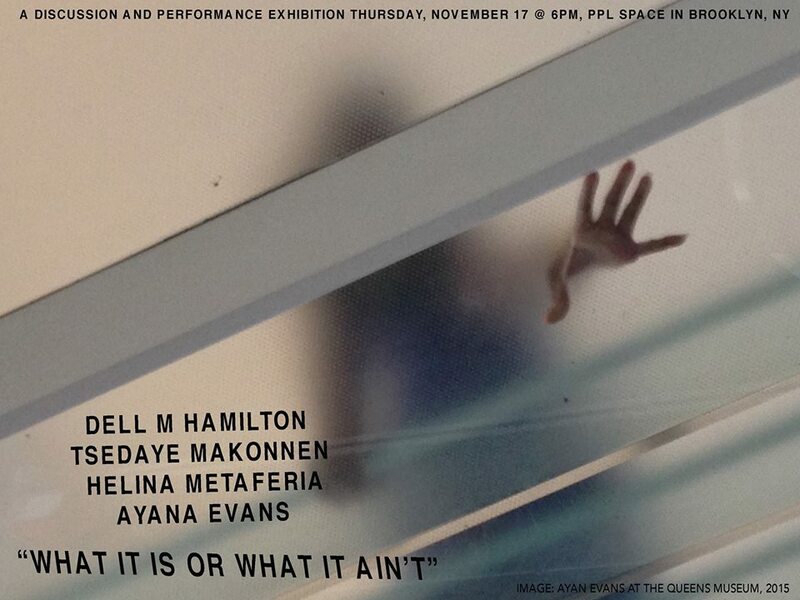 The public discussion is followed and framed by performance works by Helina Metaferia, Tsedaye Makonnen, Dell M. Hamilton, and Ayana Evans. This evening as a whole debates four solo artists' relationships with their own practices, through both artworks and discussion of artworking, providing a public forum for performance practices that deal with beliefs in the strength in the collective voice of black people/women (even if those voices disagree or contradict) as well as resistances to processes commodifying and objectifying identities and artists. A donation of $5-20 at the door is requested to provide barebones honorariums to the participating artists though no one will be turned away for lack of funds.